Most irrigation projects require a pump. In remote areas there is often poor access to electricity making AC pumps impractical. Diesel and petrol powered pumps are often used; however they are expensive to run making them uneconomical. Farmers often run out of money to operate their pumps before the crops are ready for harvest. Mono has adapted their solar pumping technology to operate with drip and other forms of irrigation. 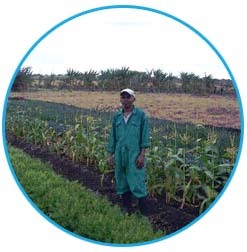 Mono Pumps offer a solar drip irrigation system for small scale irrigation projects, enabling sustainable agriculture. Drip irrigation uses the least amount of water and ensures that the water source is used most effectively. Mono can design and supply complete irrigation packages to suit any requirement. We have extensive experience with many thousands of solar pumping installations across Africa, Asia and America.